Welcome to the third stop on the Sailor Top Blog Tour! I was so honoured to be asked to join in to show off this cute new pattern. I first met the Fancy Tiger girls, Amber & Jaime at the Makerie retreat in Boulder, a few years ago. Their super cute shop in Denver is a must-see if you are ever out that way. I’ve loved following their adventures online ever since and was very excited to see that they were publishing their first sewing pattern. When I got the pattern I knew I had to pick out one of the new Cotton + Steel cotton lawns and the grey Truly Outrageous Gems couldn’t have been more perfect (Grey + Gems!). I also decided to add a cute lace trim detail with the new Botanica Tinctoria Eyelet Lace. The Sailor Top is super fun and easy to sew. I was able to sew it up in just one night. The instructions are very clear, so it’s a good project for a beginner and a breeze for an experienced sewer. Finishing details are always important to me and this top is beautifully finished. The sleeves are raglan, which are simple to sew on and they finish with a nice wide facing. I also love the pretty neckline. It has the perfect amount of gathers finished with a simple yoke. The pattern allows for a deep hem which I always love the look of. Once I hemmed the top according to the directions, I just stitched on my eyelet trim on the inside of the hem. I debated adding trim to the sleeve hems, but decided to keep it simple, knowing I can always add it on later if I change my mind. 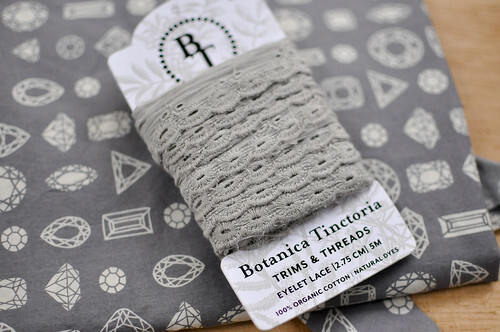 The Botanica Tinctoria trims are naturally dyed so the colour palette to choose from is super soft and pretty. I have to remember to use more trim in my projects, it adds such a nice detail. The Sailor Top fits me really well. I found the underarm seam to be a bit tight fitting, so I just clipped notches into the seam allowance to release the tension and it’s much better now. Another alternative would be to trim down the seam allowance. I can see lots more of these cute tops making their way into my wardrobe! Most likely a nani IRO one next! Would you like to win a PDF copy of this pattern?! Just leave a comment below before November 1st Midnight EST. I’ll choose someone randomly. Visit the rest of the blog tour to see all the other Fancy Sailor Tops in action! 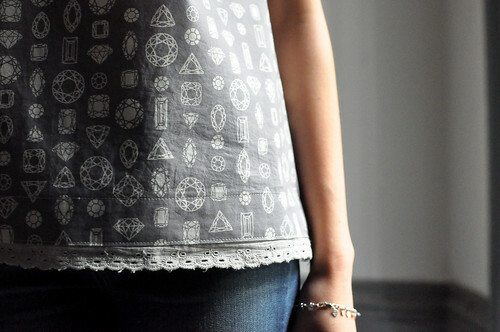 Love the grey print for this shirt. Would like to make this top. I so want to make this top! The top is lovely! and gray fabric with diamonds?? want! Gorgeous! I would love to make that pattern. What? A new handmade top in one night? Yes, please! The eyelet trim is lovely and really is the extra touch for the top. The fabric is just right for jeans or a nice small cords pant. Love this top! Reminds me of some of Cal Patch’s work. This shirt looks great on you! I’ve been looking for pattern that will work well with voile. I think I need to get some of that grey voile too! This is such a great pattern & I love your lacy trim! What a great top! Love the fabric and trim both. Next one in Liberty, for sure! Karyn, I always love the fabrics you pull together for your makes. In this case the extra touch of the trim is just gorgeous. I need to take a closer look at those babies at your online shop! Yes please I would love a chance to win this cute pattern! A great pattern – I love your version! I love this pattern. I bet it would be adorable in a tunic length to wear with leggings. Great top. It’s a perfect layering piece for fall. Love the pattern, and the trim you have added is beautiful! Pretty pattern and beautiful execution! And I would love to add this to my project list! beautiful, beautiful!! that grey is just right. i love it! Love the lace and gray! Love the added trim! What a good idea! Nice pairing of pattern & fabric too. I love this pattern! And the fabric and trim you chose are perfect. I’m going to have to check out those trims. Your top is so pretty! I love the trim detail 🙂 Thanks for the chance to win! I wasn’t sure about the shape until I saw this post with the lovely lace trim detail! I’m in love! I love this top — your choice of fabric & trim is perfect! What a pretty top, and looks so versatile too! I love your choice of fabric and trim. This pattern could be made in so many different types of fabric, love it! I want to make this! I love the print you chose to make the top out of. Your top is the cutest I’ve seen!!! Love it!!! Cute pattern – and well styled. I always love your fabric choices! This is such a great version of this shirt! Your trim looks amazing! Here in Florida, the weather is always agreeable for this type of top. It would be great with shorts, capris, or jeans! Love the fabric and lace you chose…. Such a wonderful fabric and pattern style. I could see this looking stunning in a Marimekko print too. The soft grey lawn is beautiful in this top, and the little lace edging is a lovely detail 🙂 a great pattern! What a fabulous top ! I think I need to make one! This is gorgeous. My favorite one so far. I loved this pattern!This fabric is just perfect for it! love the trim detail!!! Very cute! It’s beautiful! Just the sort of simple, wearable top style I know I’ll make many of. I can see myself making one in nani iro too!!! Thanks for the chance to win this greats pattern. Beautiful job, Karyn! A perfect top for the weekend wardrobe! The trim really adds a nice touch! Super cute! I’d make a top for me and size down for my daughter. So adorable. Love the gray! I love the added touch with the trim. This looks like a top I could never have too many of. I’ve been following this top on the blog tour, and I absolutely love it! Thanks for the chance to win the pattern! Love the style of this top and love your use of the trim at the bottom! I love the trim you chose! What a great and versatile top. Love this top! The trim is a fantastic addition. What a great combination: the pattern, fabric and trim work so well together. Thanks for sharing your thoughts on this pattern and for the chance to win a copy. Really, really love your version of the top! I would love to mimic your lace trim detail at the hemline. It’s beautiful. What a cute top! I love your fabric too. Thanks for the giveaway! Oh wow! That’s awesome! I love your fabric selection, and that lace trim! I would love to make this sailor shirt. Would make a lovely maternity pattern as well! I would love to win a copy! Sweet pattern and I love the fabric and trim combo. Love the pattern! & your Top!! Using the lace trim is Perfect with fabric you used! Sweeet! I love the fabric you chose for this top- perfect! And that trim looks so beautiful (love a vintage/ antique trim and this has that look). I love this pattern and can’t wait to give it a try! This is pretty. Love the pattern! That’s so pretty! I’d love to win a copy of the pattern. This is just my style of top! It’s understated, yet can be dressed up with a belt or brooch or scarf. I’d love to make several to add to my wardrobe! Thanks. Love, love, love this top! Wouldn’t it be amazing in Liberta tana lawn Kevin (the print with the zodiac symbols and stars)??!! Hi Rhiannon – Just chose you as the winner for the Sailor Top pattern!! I’ll get in touch by email to make arrangements. Yay!! I love your top! Beautiful fabric and pretty pattern! Thanks for the chance! I love everything about that top! From the print of the fabric to the lace detail. Simple but classic! The Botanica Tinctoria Eyelet Lace just knocks it out of the ballpark, WOW! Beautfilly done in grey and it fits you nicely. Beautiful! Beautiful! Thanks for the inspiration. 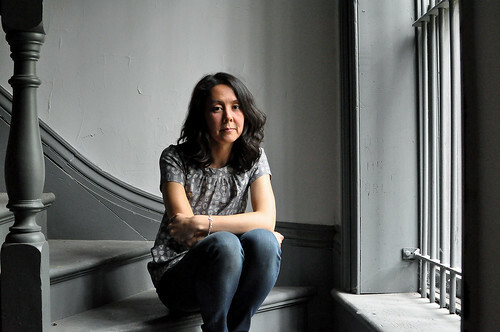 Nani Iro sounds just the ticket, I can picture it now! The grey and gem stones is also a very nice combination, love it. Love the addition of your trim. What a fabulous idea!! I love this top. Thanks for the chance to win the pattern! Charming! Love the gem pattern too! I love this blouse, esp with the lace trim at the bottom. I’m definitely adding lace when I make mine some day. I love it! Can’t wait to make one of these myself. Such a nice pattern! I love the trim! Your grey version turned out beautifully! An excellent pattern! Thank you for the link to the Fancy Tiger Crafts website and thank you for the giveaway! Beautiful pattern, Karyn. Pick me. I love this top! Your fabric and trim choices are superb. I agree the trim is a really nice touch and makes it a bit dressier. The grey color makes this top such a timeless classic! Love the lace trim on this one and the gemstone fabric is awesome, looks so good! Thanks for the chance to win. This fabric and trim combination is an inspiration. Such a beautiful combo of fabric, lace and pattern! Would love a pdf of this one. I would love to win a copy of this pattern, it looks lovely! I would love this pattern. The lace detail is very sweet. Sailor top looks like a great way to showcase so many pretty fabrics in a comfy basic shape! Saw so many photos from last weekend’s Quilt Market of new fabrics coming soon, it will be hard to choose. A special Nani Iro, Cotton+Steel or Liberty lawn would be beautiful. Solid color with a bit of small print contrast along the collar & cuffs would also be fun.